While wildfires can happen anywhere in the United States where there are brush or trees, different regions have special issues to address based on the type of landscapes found in the area. Much of Arizona is considered a high-hazard fire environment. In the Southwest, there are six basic types of vegetation that are cause for concern during wildfire season: grass and desert shrubs, riparian areas, ponderosa pine forests, pinyon-juniper woodlands, mixed conifers, and tall chapparal. Many people think of the desert when they think of Arizona. However, it may surprise you that there are six national forests in Arizona that are high-hazard fire environments: Apache-Sitgreaves, Coconino, Coronado, Kaibab, Prescott, and Tonto. It is unlikely that large wildfires will have a significant direct impact on large metropolitan areas like Phoenix and Tucson, but there certainly are indirect impacts of such fires on the major metro areas of Arizona. Smoke can be hazardous to many people, and it can drift very far during wildfire season, resulting in decreased air quality in major cities of Arizona during the height of wildfire season. If you have respiratory problems, make sure you keep current on any wildfires burning in the region—authorities will generally let you know when there are advisories for smoky air. Not only does fighting forest fires have an obvious cost, but wildfires also affect insurance rates as well as Arizona tourism during the summer season, resulting in a high economic impact on the metropolitan centers of the state. Because of the diversity of vegetation across Arizona, the state has many different levels of wildfire hazards. 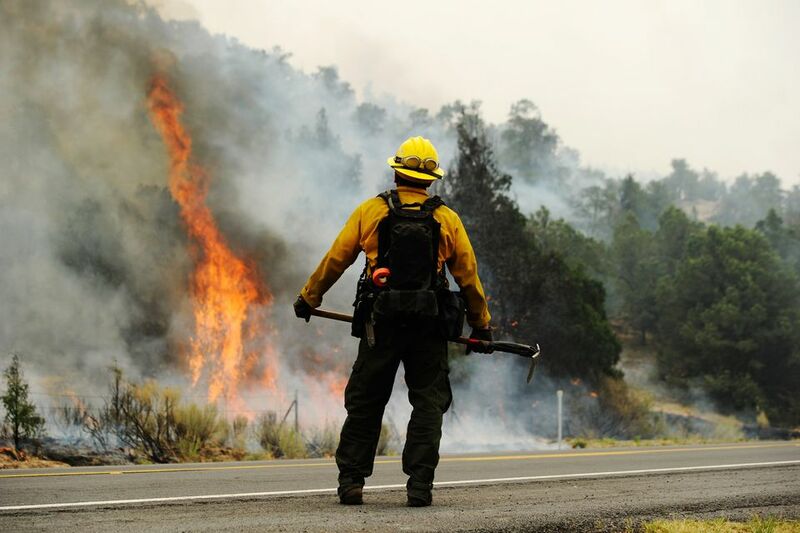 While mixed conifers burn slowest at 10 acres an hour, tall chapparal shrubs that populate most of the state can burn up to 3,600 acres in the same amount of time, and grass and desert shrubs burn almost as fast at 3,000 acres an hour. Riparian areas, meanwhile, can burn at up to 1,000 acres in an hour and pinyon-juniper woodlands burn up to 500 acres in an hour and old-growth ponderosa pine forests burn up to 150 acres in an hour. Depending on which part of the state you're visiting, you'll find a mixture of all six of these vegetation types, resulting in a high-hazard fire environments. The Apache-Sitgreaves National Forest in east-central Arizona, for instance, features two million acres and 450 miles of rivers, streams, and woody vegetation with high-hazards for wildfires. In order to ensure your safety on your next trip to Arizona, especially during wildfire season, it's important that you check local forecasts and parks' services for announcements related to the fire hazard at the time. The Southwest Coordination Center and National Interagency Fire Center are both government-run agencies designed to not only fight fires in emergency situations but also keep the general public informed of burn conditions and danger levels. Be sure to check for emergency bulletins in the Arizona Emergency Information Network for up-to-date information on current wildfires in the state. Additionally, it's important to understand the latest Arizona fire restrictions and bans so that you don't start any wildfires with illegal fires during wildfire season.